One of the best ways to entertain my energetic two year old is to let him loose in the garden. We’ve worked hard to make it a safe space for him so when the sun in shining (or even when it isn’t) I can open the doors and watch him run around and have the time of his life out there. When I heard that Plan Toys were bringing out a range of garden toys I couldn’t wait to give them a try! We are massive fans of Plan Toys and we’ve already tried out some of their amazing bath toys. 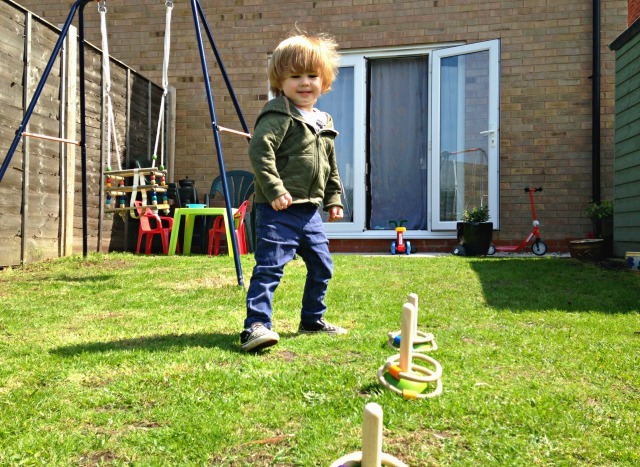 I had high hopes when we received the Meadow Ring Toss from The Toadstool and it certainly has not disappointed us. My absolute favourite thing about this, and all Plan Toys, is the feel of them; they are wooden but feel so substantial and sturdy. 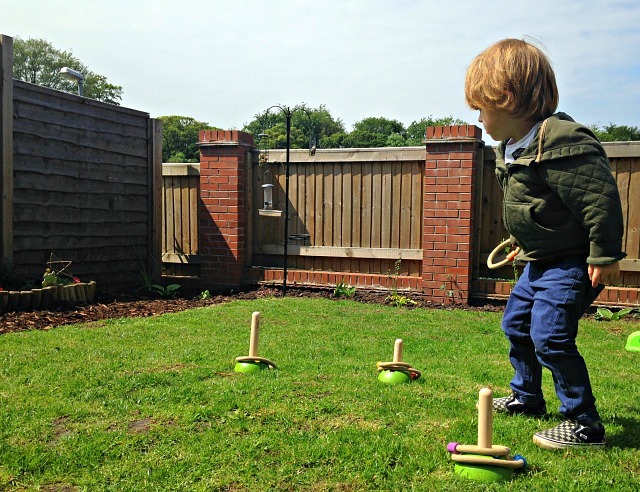 The Meadow Ring Toss is another tactile toy with lovely bright non-toxic colours and it’s a bonus to know that they manufacture and distribute in a sustainable way. As soon as Lucas saw the box he was pestering me to open it, although you could easily play this indoors I wanted to wait for a nice day to have a play in the garden. There are three posts of different heights and six rope rings with a coloured marker on each which corresponds to a post. I like this as it meant we could have a chat about the colours while we were playing; Lucas knew which post to aim for and when it was my turn he could still get involved my showing me which post to throw to. It’s a lovely toy to keep outside on a sunny day and Lucas just kept going back to it and having a go. It’s perfect that we can all get outdoors and play it together as a family but equally Lucas asks for it when he is playing by himself. It’s great to teach him about turn-taking so he knows that he has to wait for his go but he can still enjoy watching others play. I have to say our success rate at actually getting the hoops on the posts wasn’t high, in fact I think Lucas was better that us! That just gives us more reasons to get out and practise though. The whole things packs away neatly in the small box it arrived in and we have already taken it out when visiting family on a sunny day. 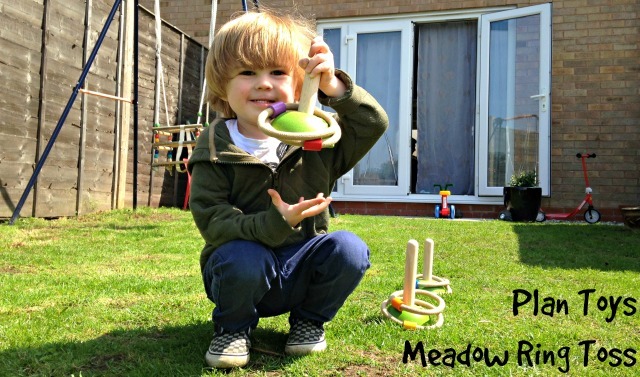 The Plan Toys Meadow Ring Toss is £22.00 available from The Toadstool now, perfect for a little summer holiday treat! I am always more than happy to pay a little bit more when I think I am getting good value for money and I know this is a high quality, sustainable toy. It’s something that we will be able to get out every year; the twins will be able to enjoy it as they get older and it will play a big part in our summer garden days. I suspect it will also end up being played with indoors on those rainy days, I’ll just have to clear a space first! Disclaimer – We were sent the Plan Toys Meadow Ring Toss to review as a part of my role as a Toadstool Ambassador. All opinions are always my own. Lovely pictures of Lucas in action! Thank you for a great review! Thanks Niki, he absolutely loved it so it wasn’t hard to get some snaps of him! This looks brilliant, so much cheaper than I thought it was going to be! I love wooden toys and anything that encourages taking turns is brilliant for us right now. Z gets really eager to keep taking his turn. It looks like it’s be fun for ages too. Yes it does look like it will be played with for a long time with our boys which I love and we are desperately trying to teach Lucas to take his turn!